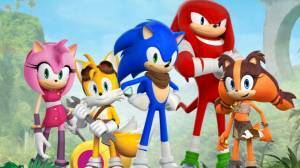 This free-to-play mobile game is the sequel to SEGA's endless runner Sonic Dash and features the cast and world of the new TV series Sonic Boom. The object of the game is to try and catch Dr Eggman while gradually unlocking Sonic's friends: Knuckles, Tails, Amy, and Sticks, a jungle badger introduced in 'Sonic Boom: Rise of Lyric'. Running is automatic and switching lanes is achieved by swiping your device's screen in the direction you want to go, swiping up or down will cause you to roll which is an attack that will dispose of any enemies that are in your way. Each of the characters has their own special abilities which you can use to deal with the hazards that they encounter on the racetrack. How do Score Multipliers Work? No discussions open for Sonic Dash 2: Sonic Boom at the moment.